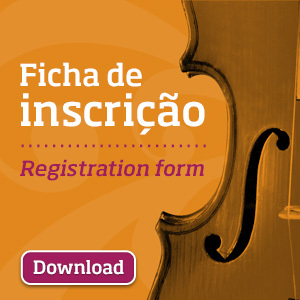 The Winners Concert of the 5th International Chamber Music Competition “Cidade de Alcobaça” (CIMCA), which marks the closing of this competition, was anticipated for November 23rd, adjustment that will keep the same hour, 9:00 pm, as usual at the Cine-Teatro de Alcobaça – João d’Oliva Monteiro. The competition will start also there, on November 19th, on Sunday, where it will take place the Check-in between 4:00 p.m. and 6:00 p.m., and the draw of the Eliminatory Round, at 6:00 p.m., which marks the start of the event. We remeber that, among the participants, we have mostly groups and musicians coming from Portugal, Spain, Ireland, United Kingdom, Finland and Japan, accounting 13 groups in the competition and having the presence of more than 40 musicians, divided between the two categories (Junior and Senior). For this edition, the names that will form the Jury are the following: António Rosa (President of the Jury, Artistic Diretor and Orquestra Sinfónica do Porto), Kika Materula (Artistic Director of Xiquitsi and Orquestra Sinfónica do Porto), Pedro Carneiro (Orquestra de Câmara Portuguesa and Escola Superior de Música de Lisboa), Luís Magalhães (Stellenbosch University, África do Sul) and Luís Tinoco (Escola Superior de Música de Lisboa and Director of Concurso Jovens Músicos RDP). Regarding prizes, the winners in the Senior category will receive a prize value of €4000 and a concert under the ambit of Cistermúsica – Alcobaça Music Festival, Stellenbosch Chamber Music Festival, Festival de Estoril Lisboa and Maputo International Music Festival (2018 editions). For the Junior category, the prize will be €2500 and a concert under the ambit of Cistermúsica – Alcobaça Music Festival (2018 edition).